Boxing lore is filled with great rivalries. When top fighters grow familiar with each other under the stress of combat, an almost luminous quality can emerge. As the two opponents learn more about each other, their fights most often become even more hotly contested. But in boxing history, one famous series stands out. From 1915 to 1921, Jack Britton and Ted “Kid” Lewis fought an astonishing 20 time. For most of this rivalry, the World Welterweight Championship was on the line. This, of course, was an era when “champion” was properly used as a singular noun. 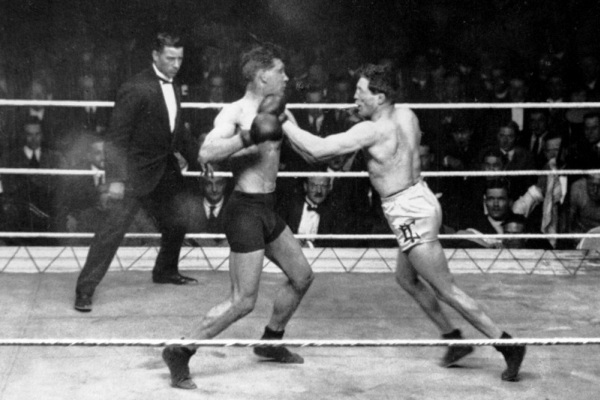 On this day in 1921, they faced off for the final time, with Lewis winning a 15-round decision to retain his belt. A century later, Britton and Lewis both remain among the top 10 or so welterweight fighters in history. Lewis is arguably the best fighter to emerge from Britain during the gloved era. In The 100 Greatest Boxers of All Time Bert Sugar ranks Britton at 28 all time and Lewis at 33. Sugar published that book in 1984, so obviously, the shifting sands of time have pushed them both back a bit in the rankings, but I would question the credibility of any top 100 list that did not include them both.